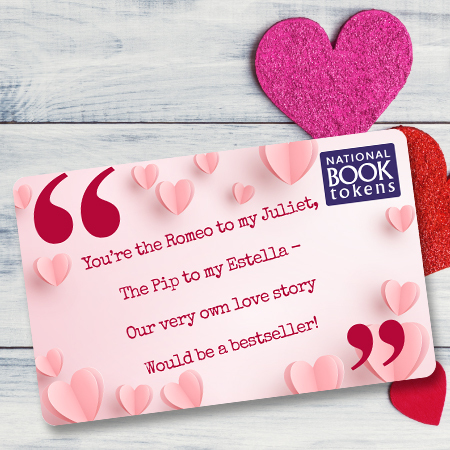 Win your romantic poem on a £50 National Book Token! We gave you the chance to win the perfect Valentine's gift for your favourite bookworm and were overwhelmed by your creativity and passion. Congratulations to Sian W. from Essex, who made us chuckle with her lovely literary poem. She won a £50 National Book Tokens gift card featuring her winning verse, to be treasured forever (and spent on lots of lovely books, of course). Still need a gift for Valentine's Day? Pop to your local bookshop or send a National Book Tokens e-Gift card. Show how well you know them with a personalised National Book Token gift card for all occasions, from birthdays to bar mitzvahs. So will you please be mine? You are the fresh new book I open and the page I always find. I read you back and forth - each time, there’s something more. keep a place for me, always. By your love of great books. Because I'm no Elizabeth B! please be my bookie-wookie one. Closing date is 11:59pm on 7th February 2019. A minimum of one and a maximum of three poems may be submitted per entrant. The winning poem will be selected by Book Tokens Ltd. and the winner will be contacted on Friday 8th February. In the event of a winner not responding after 3 days, we reserve the right to allocate the prize to another winner on Monday 11th February. The prizes are non-transferable and there are no cash alternatives. The Promoter reserves the right to amend the specification of the prize or offer an alternative prize. The competition is open to UK and Republic of Ireland residents aged 16 and over except for employees of the Booksellers Association and Book Tokens Ltd. and employees of participating bookshops. Please note that personalised National Book Tokens gift cards are not currently available in Euros, so if the winner is a resident of the Republic of Ireland they will receive the alternative prize of a €60 National Book Tokens gift card in a standard design; however, their winning poem may still be used in post-competition publicity. Entrants agree to Book Tokens Ltd. using their details in post-competition publicity. Your details will not be used for any other purpose, or passed onto any third parties, unless specified. The promoter reserves the right to withdraw the competition at any time, with no prior notice.